If you are looking for a real page-turner, give this book a try! Suspenseful, and well told this story drew me in from page one. I have never read this author before, but I surely will be reading more of him now! Tom Rob Smith writes deft and engrossing, character driven thrillers . His Child 44 trilogy (Child 44, Secret Speech & Agent 6) won high praise. 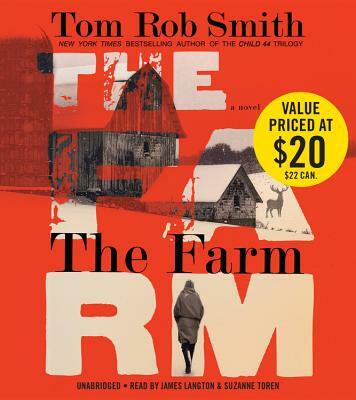 His most recent, The Farm, is one of those books that grabs you from the first paragraph. A young man in London receives a frantic call from his father who has retired with his mother to her native Norway on a seemingly idyllic farm. His fathers tells him that his mother has become violent and he had to commit her to an asylum. As he is preparing to go to his father's aid he receives a call from his mother saying she has been released and is boarding a plane for London and that his father is involved in a conspiracy and cannot be trusted. What ensues is a compelling tale in which the truth is elusive and the ending truly surprising. Daniel prepares to rush to Sweden on the first available flight. Before he can board the plane, his father contacts him with even more frightening news: his mother has discharged herself from hospital, and he doesn't know where she is. I'm sure your father has spoken to you. Everything that man has told you is a lie. I'm not mad. I don't need a doctor. I need the police. I'm about to board a flight to London. Meet me at Heathrow. Caught between his parents and unsure of who to believe or trust, Daniel becomes his mother's unwilling judge and jury as she tells him an urgent tale of secrets, lies, a horrible crime, and a conspiracy that implicates his own father.